Plastic jigsaw puzzles are ideal for children and promotions! Make your photo jigsaw puzzle last even longer by creating it from plastic. Our plastic photo puzzles are the same as our standard personalised cardboard jigsaw puzzles. The only difference between standard jigsaw puzzles and plastic jigsaw puzzles is that we use sturdy plastic instead of cardboard. 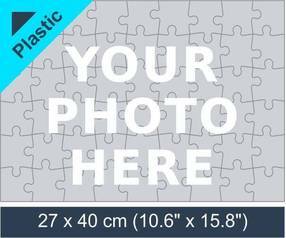 To start creating your plastic photo jigsaw puzzle select jigsaw size and upload a photo, design or artwork! Share your memories or stories by creating plastic jigsaw puzzles! To create a plastic jigsaw puzzle, you only need to select your photo jigsaw size; upload your photo, design or artwork; and choose the quantity you want to order! Plastic jigsaw puzzles are much more durable than cardboard puzzles. We use 2mm (0.08”) thick plastic to ensure that the pieces are strong enough for frequent use. Our plastic photo jigsaw ir great for kids and for company promotions. We offer six different plastic photo jigsaw puzzles with different piece counts. You can customise these plastic jigsaw puzzles with your photo, artwork, design or text message. Plastic jigsaw puzzles are ideal for companies as marketing tools. You can be sure that the jigsaws you give to your clients, future customers or business partners will last for a long time and that the message, design or company logo will remain in their minds. This will remind them of the services or products that your company provides. Plastic jigsaw puzzles are ideal for kids! It is safe for your kids to play with plastic jigsaw puzzles! Since they are very sturdy, you can be sure that your little one won’t break the pieces. Even if your child spills a bit of water or juice on the jigsaw puzzle, it will remain intact, as the coating and the plastic itself are both water-resistant. You can take them anywhere you like! Because the jigsaw puzzle is made of plastic, the puzzle can even be done outside the house. Finally, there is a jigsaw puzzle that can be taken to the beach or park! Due to the sturdy, easy-to-clean material that we use, you can easily clean the photo jigsaw after it has been exposed to mud, sand or dirt of any kind! Custom-made jigsaw puzzles are great for children because they are educational, they keep kids entertained and they help children develop important skills. Order one for your child today!